Fill out our simple form and get quotes from local face painters. Face painting is the perfect distraction for little ones. Watch them transform into a beautiful butterfly or spooky zombie! Face painter hire brings out the fun and creativity in everyone, old or young. Find a professional face painter in your area here. Peanut has been face painting for over twenty years. He uses the child's imagination to create very special face paintings. Our trained face painter will offer you face painting and glitter art only using the best products and techniques adding fun and sparkle to your event or party. 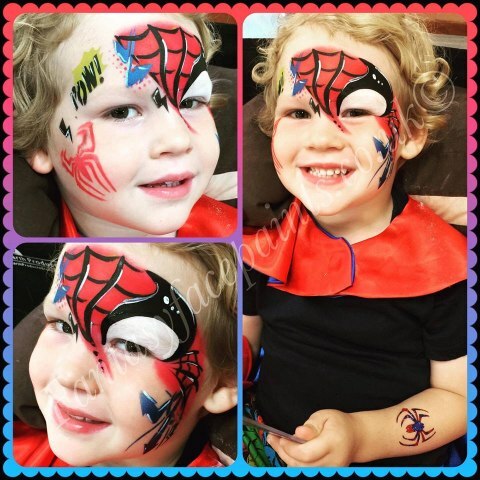 We offer a fabulous face-painting service, available to add that extra pizazz for your party, event or promotion. Get in touch to find out more. Face painting for all events. With 26 years experience. Good quality and fast face painting. Any request catered for with bespoke designs. No copying from books. Fun, professional fave painter. One of the fastest in town without compromising on quality! Any event catered for. Glitter tattoos and festival glitter face painting available too! We can provide face painting/glitter tattoos/glitter faces for any event. We have a team of talented face painters and glitter artists available nationwide. Public liability checked. Also note that it will take an hour to paint between 10 - 15 faces. Children under 3 years old cannot have their faces painted. Based in Telford, Shropshire, Fantasy Face Paints have been operating since 2014. Catering for children's parties, weddings, christenings and corporate events they pride themselves in offering high quality products and professional service. In order for us to provide an accurate quotation, we require the location, date and time of your event and the approximate number of participants. We would advise to ask to see examples of previous work and their set up. Perhaps to look at their website, this can be very helpful with your final decision. Ask what products they are using - professional face painters use high-end products which cannot be bought in shops. Ensure they are only using cosmetic grade products too - not craft glitters which can damage the eye. Ask to see a copy of their insurance - this is key. An OCN level 2 Accredited will have completed training which covers health and hygiene and will work to strict hygiene practices (1 sponge per face, no under 3's for face painting etc). I have two young children of my own and wanted to run my own business to allow me to spend time with them during the week. I am naturally artistic and creative and I love glitter and sparkles so face painting was a great career move for me from my previous 11yrs working for the Police. I love to meet people and to have fun, and seeing a child's face when they see themselves in the mirror as a tiger for the first time is priceless. We have now considerably expanded over the last three years and have a great supply of repeat custom. We have a wide range of bouncy castles and soft play including sensory equipment suitable for babies or children with special needs. One of my favourite bookings via Add to Event is a lady that books with us time and time again. I have entertained her children on several occasions and have been told that she now will not book with anyone else. She has even moved the date of her party to when I am available! I have also gained a regular corporate client from here too for whom we provide entertainment for their new store openings around the West Midlands. We have a great selection of face painters on the site, you just need to select the suppliers you’re interested in and request free quotes. Kids will be delighted to be transformed into their favourite character, however face painters cater for everyone and can create some elegant and subtle designs for adults too, making sure everyone gets involved. Perhaps you’re organising a charity or sports team event? Why not hire a face painter to paint the team colours or mascot for everyone? Face painter hire is also a popular option for festivals, adding arty, bohemian stencils and temporary tattoos to the faces of festival goers. Add to Event will help you build the perfect party with all the right suppliers, so add a face painter to your list and getting planning today.